Previously, on Thor – The Mighty Avenger: As the prince of far-off Asgard, Thor was once a contant presence on Midgard (Earth), but has been gone for several centuries. Now, he has returned to a world that is either the dawn of the Marvel Universe, or a similar universe damn near identical to the Marvel Universe. He has hooked up with old/new main squeeze Jane Foster, and has found that the floating city of Norse myth ain’t exactly the same world as the one he’s been forced into. I’m of the opinion that this book is a sorta kinda retcon tale, providing clean and accessible storytelling without huge crossovers, footnotes, editor text boxes and the usual fooferaw that makes comic books so difficult to get into these days. And, of course, since this is exactly what we, the fans, keep clamoring for publishers to provide, it has been cancelled due to low sales. On a related note, didja hear that Batman is back? And there were some sort of zombies running around for a while! I have to say that I was immediately impressed by this issue’s cover, for two reason: One, it’s a great action shot that immediately lets me know something about what I’m about to read. Two, it’s not only done by the same art team that handles interiors, it’s actually related to what happens in the book! That’s a rarity, especially for Marvel, given the recent reliance on glamour shots by big-name artists as covers. 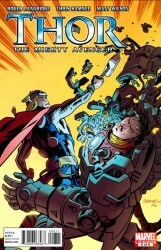 Either way, the book gives us a quick and dirty rundown of what has happened, with Thor arriving on Earth, fighting robots, trying to fit in and possibly starting a romance. Of course, last issue ended with our hero getting captured by the evil combine that has been following/testing him, and put in chains in their dungeon, separated from Mjolnir and essentially helpless. 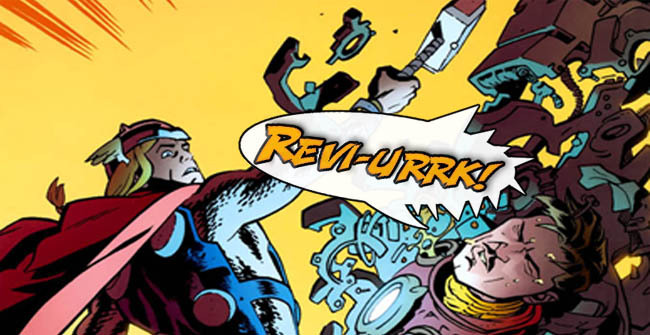 Jane can’t reach him on his cell phone (and her dialogue, “Just press the button and hold it to your ear!” is both funny and character-building for both Thor and Jane. She eventually calls the only person she can think of for help, but Doctor Henry Pym is busy as Ant-Man, and forwards her message on to another of his colleagues: one Anthony Stark. I am impressed with this book, and I liked every single page, while simultaneously understanding why it couldn’t find it’s audience. 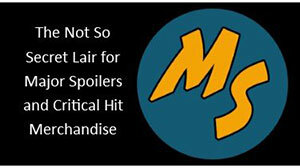 We, as comics fans, are conditioned to think of stories as canon and non-canon, and to split things into what DID happen (main books, big events, miniseries that lead into one of the previous) and what DIDN’T happen (Elseworlds, What Ifs, off-kilter revamps, and much as we hate to admit it, The Ultimate Universe.) Given a title like this that is clearly pseudo-retro, I was bothered by things like the costumes (both great designs, but if this is the “real” universe in the past, where did these designs go?) and questions of when and where and how and why. It didn’t dampen my enjoyment of the story, but it was a nagging sensation throughout the book as well. 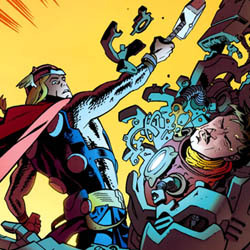 Samnee and Wilson deliver truly fabulous art throughout, and I hope to see more from them in the future, while Langridge does something that no one has done for me since Simonson: Made Thor interesting and cool. Having grabbed all the issues (one of the fringe benefits of being in full control of the back issue stock of a medium-sized comic store, Faithful Spoilerite), I can say that it’s a shame a book of this quality is getting canned, and I think it’s a prime candidate for a reader-lead mail-surge return in the near future. 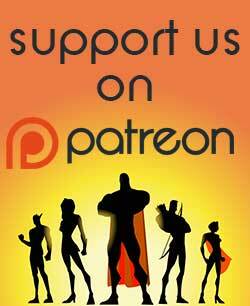 Thor: The Mighty Avengers is a fine comic book, earning 4.5 out of 5 stars overall, and reminding us all that sales are seldom an absolute measure of quality. 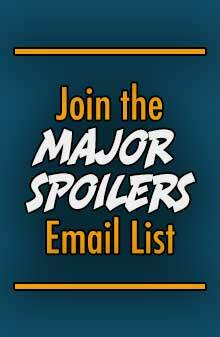 Faithful Spoilerite Question Of The Day: Are there titles that you have trouble fully enjoying because of questions of where they might fit in to continuity? This cancellation reminds me of the cancellation of The Spectacular Spider-Man cartoon. Damn sad. Oh well. Both of the Big Two have been doing the glamour shot type covers for a while now. The last couple Batgirl, Batman and Robin, Batman in Space, Batman and Marmaduke, etc, have just been action poses set to a white background. It is nice to see a real action shot for once.